It seems that some US media outlets are still getting to grips with the finer points of football, declaring that it was the Orange-clad, yellow-carded Dutch who won last night. CBSNews/AP declared, in the early hours, that "The Netherlands Wins First World Cup and Ends 22-Year Streak Without a Title of Any Kind". 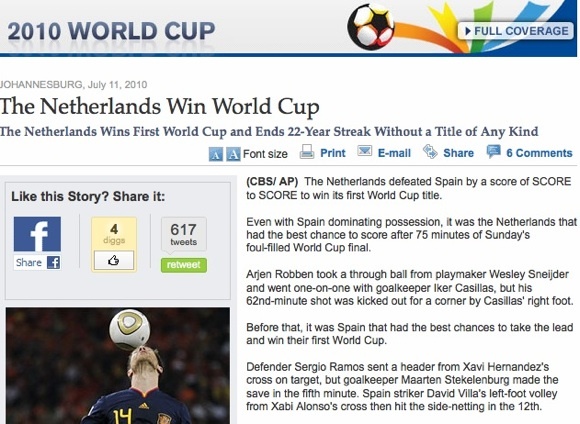 Click through and you're informed that "The Netherlands defeated Spain by a score of SCORE to SCORE to win its first World Cup title". The writer compared the feat to Spain's ending "a 44-year barren spell when it won the 2008 European Championship and can become only the third team to be world and European champion at the same time". Well, as anyone who was paying attention knows, the Netherlands' trophy cabinet is set to stay empty a while longer, bar a pack of yellow and red cards. 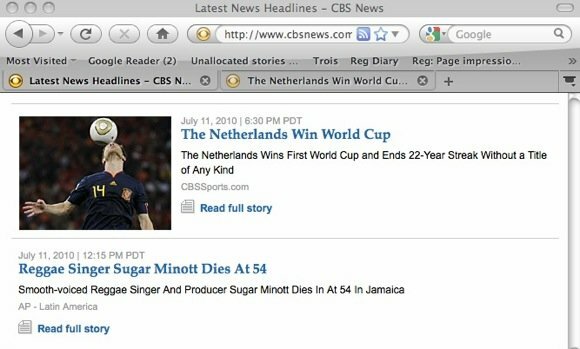 It would seem the sports desk at CBSNews have tumbled the fact that Holland actually lost the World Cup last night. Again. Still, maybe they'll have better luck in the next Soccer World Series Bowl.